Do you like throwing money away? We’re guessing not. But if you don’t know what you’re throwing away, then you may be throwing away money on a daily basis. 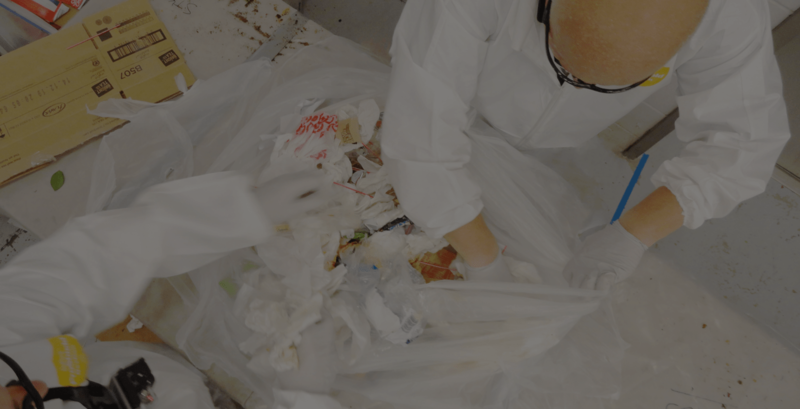 And the only way to find out what you’re literally throwing away — how efficient your facility’s waste collection system is — is to conduct a thorough waste audit. And let’s be real, a waste audit probably isn’t at the top of your personal “Oh, I’m looking forward to that!” list. But don’t worry it’s at the top of ours! We’ll get our hands dirty so you don’t have to. For over 15 years we’ve been conducting waste audits in a wide variety of locations — from commercial office buildings to operating rooms, sports stadiums to restaurants to college campuses. We’ve performed waste audits for clients who deal with over 12 million pounds of waste annually. We know our way around facility management, waste collection methods and proper waste diversion process. We have the expertise to systematically analyze your waste stream, correlate the data we collect, and make practical and achievable recommendations that will streamline and modernize your waste processing system. We’ll be your partner in designing and implementing the best waste collection and disposal system for your facility or facilities. All we need is the opportunity to dig through your trash and tell you what we find. We have 3 common types of audits. If you have any questions, give us a call and we can discuss the right audit to suit your needs. Going for LEED Certification? We’ll get down and dirty to collect the data necessary for the MR6 credit. Our team will evaluate a 24-hour period of waste at your site and provide a LEED audit report of our findings, complete with data, pictures, and recommendations. The audit will provide insight on the successes of your waste and recycling programs, as well as ways to increase recycling rates while also reducing contamination. Waste is one of the five categories used to formulate a facility’s LEED performance score, along with the Energy, Water, Transportation, and Human Experience classifications. With the data we collect we’ll be able to help you achieve the MR6 credit and any other waste collection and recycling goals you may have. We may even help you pursue goals that were not even on your radar. We’ll identify recyclable materials that are finding their way into the municipal solid waste (MSW) stream and help you divert them. Likewise, we’ll find ways to help you divert all organic materials away from MSW facilities and into a compost stream. We’ll show you the waste that’s not going where it should. Then we’ll guide you on how to get your waste into the right place at the right time — and how to do this day in and day out, year after year. We also know the lingo of the renewables and recycling industry and are very familiar with MR6 credit. We will produce a LEED audit report in the proper format that you can plug into your application. We can answer your questions, share our experience, and be an ally in your efforts to modernize and implement sustainable operations at your facility. Are you interested in just single-stream recycling and trash or are you focused on one specific waste stream? Our specialized team of auditors can work with you to design a waste audit specific to your needs. You pick what to focus on and we’ll do the digging. We can provide an audit report of our findings along with a list of best practices to help you overcome existing challenges, reduce total waste generated, increase recycling success, or identify wasted material to help cut costs when it comes to your “garbage”. As is often the case, a set of “new” eyes can often see things that have become normalized and repetitive. Any facility will have operations that have become routine — “Hey, that’s just the way we do it” — and, well, everyone’s gotten used to doing things that way. We’ll not only bring our “new” eyes to your facility, but eyes that are trained and experienced in the ways of waste streams and the subtle inefficiencies found in waste disposal systems. We’ll help with that struggle. By systematically and professionally conducting a waste audit or multiple audits of your facility, we’ll help you to see what’s in front of your proverbial nose. We’ll not only put a metaphoric fine-tooth comb through your trash, but also through the design of your waste disposal system. We’ll examine both the physical facts on the ground and also the systemic underpinnings of your trash collection operation. Like a good financial audit, our waste audit will take a good hard look at a mundane aspect of the everyday operations of your facility or business. We’ll look for efficiencies that can be wrung out of your daily operations, industry best practices that can be instituted, and overall make one aspect of your operations leaner and meaner. Whether your facility is a 9 to 5, Monday through Friday workplace or a stadium that is host to tens of thousands of fans at major sporting or cultural events, we have the experience to do a waste audit for you. We’ll take an in-depth look at what is being thrown out by employees and visitors at your facility. Then we’ll make a plan on how best to handle your waste stream 365 days a year. Our knowledge can help you cut down on waste that can and should be recycled or composted. We’ll help make you more environmentally friendly. We’ll also help you save significant money — on an annual basis going into the future — by streamlining your operations. Never gone dumpster diving? You’re missing out. This is a great first step to review what is generated within the walls of your facility to establish the baseline. By walking around your facility with our “waste-goggles”, we can review the current set-up and identify opportunities to help make you more successful along your waste journey. We can focus on identifying which waste streams are collected, the ideal types of containers, trash flow, and dock logistics, just to name a few. By spending time observing the operations of your waste collection practices and poking around to see what is in your waste stream, we’ll create a “snapshot” of what trash is being processed at your facility. This will give you a bird’s-eye view of what’s going on — usually unobserved — on your property. We’ll focus on what we see going into your waste disposal system, including paper, cardboard, glass, metal, plastic, organics (compost), electronics, medical and landfill waste. To borrow a programming acronym, we’ll give you a WYSIWYG (What You See Is What You Get) analysis of your waste stream. By pulling out the camera and giving you a wide-angle shot of your waste disposal operations, we’ll give you the perspective needed to make informed decisions. Our overarching vision is to not only help you change the material facts on the ground at your facility, but also change the culture of your organization in order to pursue better environmental, public health, and budgetary outcomes. Have you looked in your trash can recently? So, what will happen when our team visits your facility to conduct a waste audit? To answer that as non-technically as possible: we’ll come rifle through your trash, then we’ll write about what we found. But you’re probably looking for a more technical answer than that. Right? We’ll carefully examine and record the details of the waste streams generated at your facility over a predetermined period. We’ll set up operations at the end point of your waste collection system, examine everything — and we mean everything — that is about to leave the facility as waste, then create a detailed analysis of what we’ve observed. As part of our waste audit, we’ll produce not only an in-depth report of what we found, but also a detailed blueprint for you to follow in order to make lasting improvements to your waste management system. On the day of the waste audit — which should not be advertised to your staff, since we want to record what happens on a “normal” day in your facility — we’ll setup shop near the point where your trash removal system ends, usually near the dumpsters on your loading dock. We’ll arrive with our expertise, our experience, our tools, and our good attitudes. Remember, this will be a day out of the office for us. Who doesn’t like a break from the routine? We live for this. Once we’re set up and ready to get down and dirty we’ll start the process of examining the incoming garbage and recycling materials that make their way to the endpoint of your waste collection operation. Our waste audit will not only examine the entirety of what is in your overall waste stream, but also how efficient your current separation system is operating. The objective will be to give you specific ways to help you meet your waste diversion goals, meaning the majority of your waste will not end up filling valuable — and increasingly expensive —space in a landfill. The waste will be separated into municipal solid waste (MSW), single‐stream recycling such as cardboard, fiber, glass, metal, and plastic, organics (compost), and materials such as electronics, batteries, and chargers that have specific disposal requirements. Carefully examine and separate the contents into the proper waste stream. Bag the waste types into separate color-coded bags. Weigh the bags so we know the percentage of each waste type that is incoming during normal operations at your facility. Record via visual inspection what exactly is in your garbage. Ascertain the percentage of recyclables that are not making it into the proper recycling stream. Pay special attention to organic materials that are not making their way into a composting stream, including where exactly in your facility that organic material is coming from. By bearing down and doing this kind of detailed examination of your waste stream we can share with you what’s going on “under the hood” of your facility’s operations. Special event facilities have more moving parts and a less controlled waste stream on a “game day.” In these cases, we’ll not only concentrate on the endpoint of the waste stream but also go mobile in the facility and try to see where your patrons can help you in the task of streamlining the waste collection process. With some guidance and opportunity, the good people attending your sporting event, concert, or other special event can be part of the large-scale solution to meeting your waste disposal goals. We’ll focus on finding opportunities for creating sort centers near kiosks and concession stands, designing signage and color-coded bagging, and examining opportunities to adopt compostable service ware (plates, napkins, etc.) as part of concession operations. Making the collection of clean recycling and the separation of organic material a deeply embedded part of the normal way of “doing business” at events you host will be the ultimate goal. After our day or days of collecting data at your facility, our team will head back to our office and crunch the numbers. We’ll then produce a confidential, comprehensive, detailed, and visually appealing waste audit report that can be used by management to inform decisions and be shared with staff as part of training. Our waste audit report will be both easy on the eyes, while also technical in concept. We are here to give you the detailed, cutting-edge information you’ll need to implement the most comprehensive and successful waste management protocols possible at your facility. We take our work very seriously. Not only as professionals who want to do the best work possible for our clients, but also because we’ve chosen to work in a field that we believe strongly is part of leaving a cleaner, healthier planet to future generations. We can help you with your financial bottom line by showing you ways to more efficiently handle your disposal of waste. But we can also help your organization leave a lighter environmental footprint behind.